New! New! New! Painter 2015! Today Corel released a brand-new version of Painter, and it's called, not " Painter X4", not "Painter 14" but Painter 2015. Wow! This latest version of Painter is first and foremost stable. I mean "STABLE". It's wonderful! You can now work for hours without fear of a crash. I for one, am thrilled. So, what else is new? 1. Mac users finally get full 64 bit support! This means faster speed for memory-intensive operations. Also you will experience improvements to brush accuracy and performance. 2. Real-time preview of Effects ... and for most Effects, a new, larger preview window...YaY! 3. Support of RTS (Real-Time Stylus) and Windows Tablet PCs. 4. Custom user Interface Palette arrangements/layouts ship with the program, and Painter 2015 includes the ability to quickly switch between them. 8. ... and finally, last but certainly not least ... New brushes! To quote from Corel "These new physics-inspired brushes produce rich, chaotic strokes by emitting particles from a central point that create lines and patterns as they move across the canvas." In plain English ... these brushes are nothing short of amazing. It's literally like painting with light. For those who have been waiting, and who have asked me about it, the Introduction to Painter X3 Part 3 class has finally arrived and is now open for enrollment. It's arrival coincides with the new web portal for DAA, and I hope you will be pleased with both. You will need to open an account at the new DAA in order to enroll in this class. While you're on the site, have a look around at the many classes which are now available in addition to mine. Also, we have two new instructors, Winifred Whitfield and Aaron Rutten, and there are more surprises to come in the near future. I hope you enjoy my new class and the new DAA. For those of you who are interested in what goes on "under the hood" of the Painter Brush Engine, an excellent tutorial series by Jason Maranto has been made available at the VTC web site. I was privileged to be able to view advance showings of the first 18 videos and believe me, this is an excellent set of tutorials. By the time you're through watching all the videos you will be able to alter and/or create custom brushes to your heart's content. Jason has a clear and concise way of explaining the inner workings of the Painter Brushes, and even those who are very experienced with Painter will find new information in this series. In case you have a slower Internet connection as I do, wait a few weeks at which time VTC will be releasing the course on USB (by which I'm guessing you will be able to buy a small flash drive with the lessons pre-loaded) Meanwhile, go over to the VTC site and take advantage of the eighteen free lessons which they are offering. Corel released Service Pack 1 for Painter X3 today. If you haven't already received a message on your computer, you can get the SP by opening Painter and going to Help>Check for updates. After waiting a few moments you should see the update available for download and installation. If it's not ready for you, wait a few hours and check again. Here is the information from the post at The Painter Factory by Andy Church on the reasons why you should install this Service Pack. 2. Prefer to start, stop and flip back and forth between Painter 12 and X3? Detailed information about the issues which were addressed may be found here. We have a new type of class being offered at DAA, and the classes are being taught by Al Mireau, a photographer and long-term instructor. Thsee classes will teach you how to use your camera more effectively and how to produce wonderful photographs. I took Al's classes several years ago and learned how and why to use my camera in full manual mode, and many other things. Although these days I mostly use one of the new, small, point and shoot cameras which only has a few manual settings (because it's small enough to fit in my purse) I still learned enough in Al's classes to make me a much better photographer than I used to be. Al's classes are open for registration and officially begin on November 11 (Monday). Don't miss the opportunity to learn from one of the best. You can read the official message at the Painter Factory. In plain English...this means that if you download and install Mavericks (OSX 10.9) you're going to have problems with Painter X3 and probably all prior versions. My suggestion is to wait until Corel has had a chance to work with the new code. It's time for Holiday Open Studio again! This is probably my favorite class of the entire year! Karen Bonaker, Skip Allen, and I co-host this session. Karen does the first and last week and Skip and I take the middle ones. 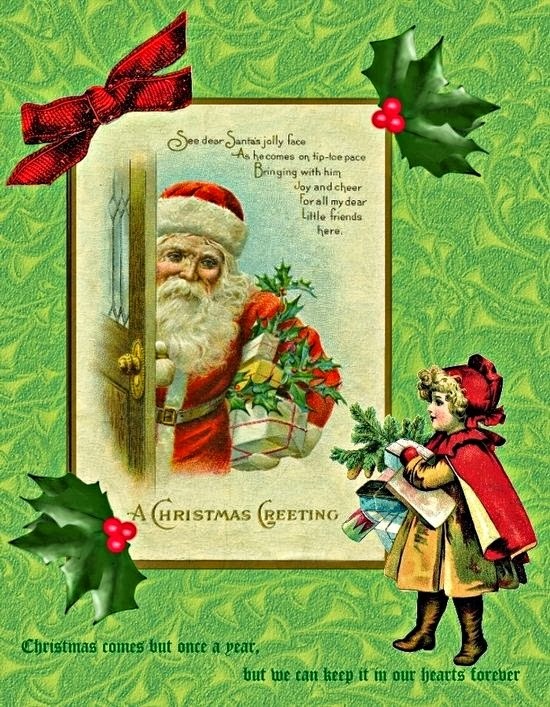 I'll be demonstrating another Greeting card, this year it will have a Victorian theme. I'll provide you with some copyright-free images to use, and I'm going to show you how to use the Channels Panel to create an unusual background. Skip keeps talking about the versatility of Channels, and I finally decided to explore and discover what he was talking about, and now I'm going to share what I learned with you. BTW, it's really not hard at all (which of course is exactly what Skip kept telling me...but did I believe him? Oh no, not me...LOL). Here's a sample of the card we're going to make this year. Hope you like it.